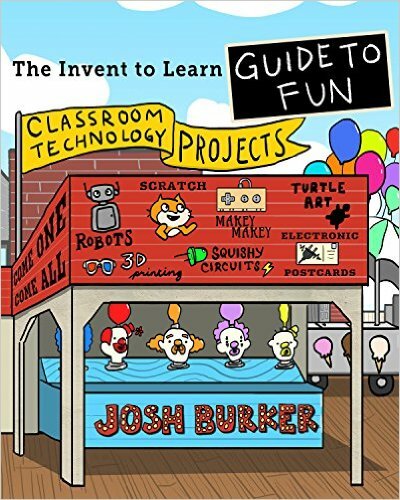 The Invent To Learn Guide to Fun features an assortment of insanely clever classroom-tested “maker” projects for learners of all ages. Josh Burker kicks classroom learning-by-making up a notch with step-by-step instructions, full-color photos, open-ended challenges, and sample code. Learn to paint with light, make your own “Operation Game,” sew interactive stuffed creatures, build “Rube Goldberg” machines, design artbots, produce mathematically generated mosaic tiles, program adventure games, and more! Your MaKey MaKey, LEGO, old computer, recycled junk, and 3D printer will be put to good use in these fun and educational projects. With The Invent To Learn Guide to Fun in hand, kids, parents, and teachers are invited to embark on an exciting and fun learning adventure! Sharona Ginsberg is the founder and coordinator of MakerBridge. Currently, she is employed as Learning Technologies Librarian at the State University of New York at Oswego.